Commercial flooring relies on high-quality designs and solutions to ensure the best product performance. Your concrete floors, for example, can deliver considerable support and beauty, but bare concrete alone may not be enough to keep out environmental concerns such as moisture infiltration. Epoxy flooring is one material that relies on a two-part resinous mix to coat your floor system and protect it from stains, damages, and a variety of other issues. One area that may prove concerning is the connection of your walls and floor system. This gap between the two materials may provide an ideal entryway for water and chemicals to seep through, disrupting your hygienic environment. In this case, an epoxy cove base may prove to be the best idea. PPI Flooring of Orlando specializes in epoxy flooring coatings, and can specialize our services to provide the right fit for your business. Today, we’ll highlight what a cove base is, how it can improve your floor system, and its many different applications. Your industrial or commercial flooring may be installed and treated to deliver the best results for your industry-specific demands, but keep in mind that there will be design limitations. One major concern comes in the form of bacterial growth in corners and edges, as moisture can infiltrate the corners and seep through the edge of your flooring. 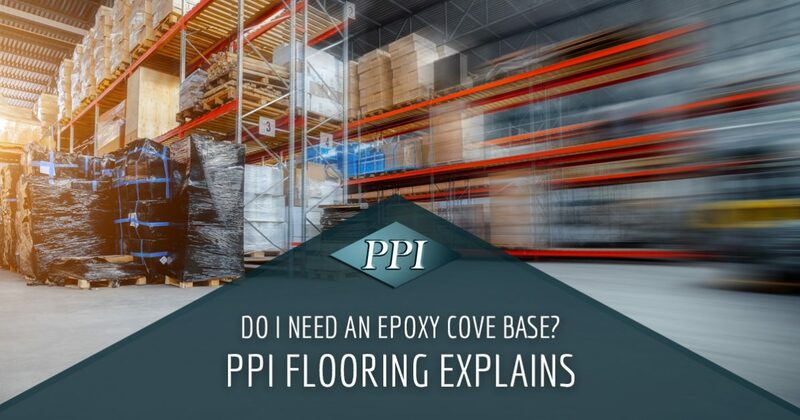 An epoxy cove base system may be an ideal solution for covering the base of your wall and concrete floor with quality protection. Typically, a cove base creates a continuous surface between the floor and the wall. Your epoxy cove base, for example, can run seamlessly from the floor and curve up the wall, relying on a radius cove to curve the corner. This overlay provides a seamless result that covers corners, allowing moisture to build without infiltration. What Are the Advantages of a Cove Base? An integrative floor system can do much to protect your floors from damage. Your concrete flooring can benefit from an epoxy coating because this additive creates a seamless surface that keeps moisture out. Self-leveling epoxy is ideal for a variety of facilities, and a base cove can help to eliminate any seams where the wall and flooring meet. This can deliver considerable improvements in buildings where frequent moisture exposure is expected. Our epoxy cove bases are also incredibly strong, featuring an unsurpassed compressive strength and ideal tensile strength. An epoxy floor coating is ideal for many industries, and can provide the protection and peace of mind your facility needs to function optimally. A cove base can minimize the edges of your floor system, providing further protection for nearly every application. For years, PPI Flooring has worked to provide the best floor systems for businesses across Florida. We understand the value that a properly designed floor can provide for your daily operations, and rely on our decades of combined experience to ensure you are satisfied with the results. We have the aesthetic finishes, textures, and everything else that’s needed to provide an ideal finish that enhances your brand while also delivering the safest results. If now is the time to coat your industrial flooring with quality, our team is here and happy to help. PPI Flooring specializes in epoxy flooring services in Orlando and across Central Florida. We have successfully installed more than 10 million square feet of epoxy, and we’re confident that we can create an ideal result for your property. Contact us today to learn more about our quality floor systems, and be sure to request your project quote!